The low-cost MultiCam 1000 Series CNC Plasma is equipped with standard features normally found only on more expensive CNC plasma cutting machines. The 1000 Series Plasma features dual drives, an engineered aluminum extrusion frame, 25mm bearings throughout, and state-of-the-art Hypertherm plasma units, as well as the legendary ease-of-use of the MultiCam Controller. 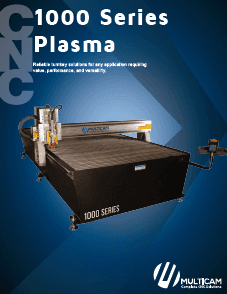 For companies looking for value in a Plasma cutter, the 1000 Series is the perfect solution. Get the most out of your 1000 Series CNC Plasma cutter by adding the tangential knife option for liner duct cutting. Combining the power of the MultiCam plasma and liner cutter machines and ShopData Systems software will allow metal and duct cutting for HVAC applications to be done with ease and efficiency making the 1000 Series Plasma the ultimate HVAC cutting system.